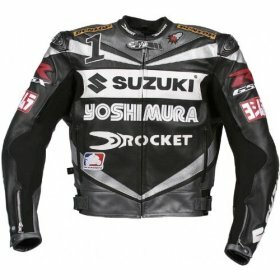 Motorcycle jackets have become an important part to riding. Besides offering protection from the wind and rain, throughout the years they’ve been dramatically improved upon to provide safety from accidents and mishaps. 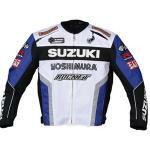 Though there are countless manufacturers producing quality riding jackets, they all use the same basic materials that have been tested for strength and durability. 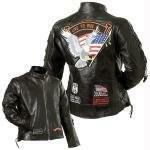 Leather jackets make up the larger percentage of riding gear available. Its properties make it very durable, long lasting, and easy enough to manipulate. Also, it helps that humans have been using leather to make clothing for centuries, so perfecting it in a jacket designed to save our hides from road rash is no problem. The better quality riding jackets will use Full Grain or Top Grain leathers, where the lesser quality ones will use Split Leather. The one drawback to leather jackets is that in order to get the best life and use out of them, you’ll need to use specific chemicals to treat and clean the jacket. 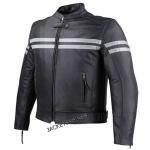 Many companies are adding textile motorcycle jackets to their leather line-ups. There are some benefits to using synthetic fabrics versus natural leather as well. 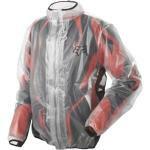 The jackets are generally less expensive and don’t require you to clean as often or take care of as much. Fabrics like Cordura are strong, water-proof, and flexible. This makes producing jackets that are abrasion resistant and durable less time consuming. Textile jackets typically use mixes of Nylon, Rayon, and other synthetic fabrics mixed with cotton in a formula designed for strength and comfort. While the list of manufacturers grows more and more each year, there are a few popular brands that are well known for their commitment to quality. Frank Thomas and River Road are both known for their more casual leather jackets. 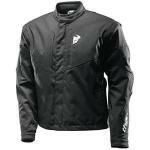 Icon, Fox Racing, and Fly Racing excel at jackets designed for the track. First Gear, Joe Rocket, and Tourmaster make great textile jackets for year-round riding. Remember that choosing the right motorcycle jacket is sometimes not as easy as just finding a color you like and clicking “buy.” Each one will fit a little differently and will have some features that you really like or aren’t too thrilled with. You will, most assuredly, get plenty of adventures out of whichever jacket you ride with, though.